Many people are advertising cheap prices for hair extensions, stating the hair is of top quality. and is real hair. Russian virgin hair maybe mentioned or cuticle Remy hair may also be mentioned. Groupon, Woucher, Living Socil have regular offers. It is very tempting. You pay for what you get and if someone can do a whole head of Hair Extensions for under £300 the quality of the hair and bonding WILL NOT be good quality. The hair may feel soft and silky to touch, however added softeners are added and after a short while of washing one’s hair the nightmare begins. Dry, tangled, limp and gets knotted minutes after brushing. A qualified hairdresser and hair extensionist knows how to apply hair extensions without causing damage to the hair and scalp. Over the years I have seen clients come to me in extreme pain from the extensions pulling on their scalp and causing itching and in some extreme cases a bleeding scalp. In the UK there are many companies advertising training courses in different types of hair extensions over a 3 day course. They are not even a qualified hairdresser. Great Lengths Hair Extensions only train fully qualified hairdressers. If you are NOT a qualified hairdresser it is not possible to use their system and train with them. 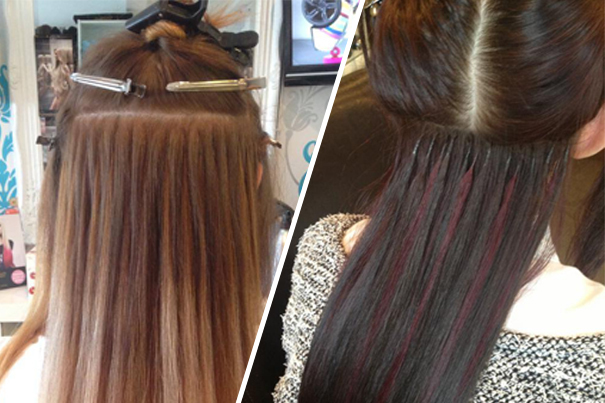 Everyone in the UK who has trained with Great Lengths are added to their website under salon locator. This makes it easy for a potential client to check someone who claims to do Great lengths are actually on their system.